Be the first to share your favorite memory, photo or story of Beatrice "Bea" . This memorial page is dedicated for family, friends and future generations to celebrate the life of their loved one. Age 88, of Union Grove peacefully passed away Sunday, February 3, 2019 at Timber Oaks. She was born June 23, 1930 to Roy and Gladys (nee Blexrud) Lockman in Whitehall, Wisconsin. Her early life was spent in Whitehall where she graduated from Whitehall High School. On April 16, 1949 she was united in marriage to Robert Melby in Whitehall, WI. Robert passed away December 26, 2015. Following their marriage, they resided in Whitehall, WI until moving to Union Grove where they had lived the past 50+ years. Bea worked as an aid at the Southern Center for many years. She was a member of Union Grove Baptist Church. Bea was a very caring and compassionate person, with a heart of gold. She opened her home to various foster children. 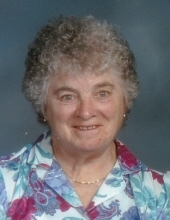 Over the years, she had affectionately fostered over 25 children. When not busy with the family she enjoyed gardening, canning and reading. But more than anything, she treasured the time spent with her family, foster children and friends. Bea is survived by her daughter Rebecca (Bob) Gunderson, a son-in-law John (Myra) Schamel, grandchildren: Shelia (Jeremy) Boldt, Robert Melby Jr., Ingrid Schamel, Erin (Patrick) White, John (Ashley Roybal) Schamel, Bernard Bissett and Audrey (Chris) LeCount, 12 great-grandchildren and 3 Great-great grandchildren. She is further survived by a sister-in-law Elsie Melby, other relatives and friends. Bea was preceded in death by her parents, husband, children: Robert Melby and Patrice Schamel, siblings: Lillian (Irvin) Melby, Helen (Orin) Hanson, Rodney Lockman, Shirley (Leo) Johnson and James Lockman. The family would like to extend a heartfelt thank you to the staff at Timer Oaks and the staff of Allay Hospice for their care and compassion. Funeral Services will be held on Friday, February 8, 2019 at 3:00pm at Polnasek-Daniels Funeral Home. Relatives and friends may visit with the family on Friday from 2:00PM until the time of the service at the funeral home. Burial will follow service on Friday at the Union Grove Memorial Cemetery. To send flowers or a remembrance gift to the family of Beatrice "Bea" E. Melby, please visit our Tribute Store. "Email Address" would like to share the life celebration of Beatrice "Bea" E. Melby. Click on the "link" to go to share a favorite memory or leave a condolence message for the family.